Hubs loves stuffed crust pizza. It is his absolute favorite. So I decided to make a homemade version for him! Now, I’ll be honest, this isn’t going to replace the restaurant version, but it is (a bit) healthier and way cheaper. I added some whole wheat flour plus you can adjust the cheese as desired. This pizza was the perfect addition to our weekly pizza and movie night! 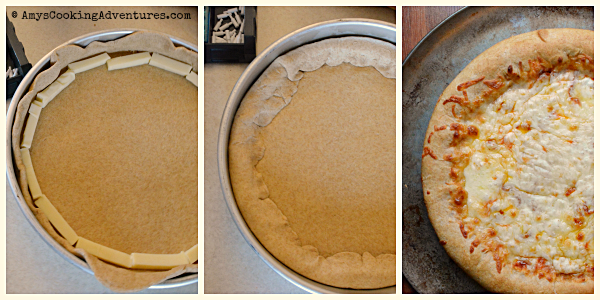 Look for a thinner crust version coming soon – I’m testing the recipe tonight! Place the warm milk, yeast, and sugar into the bowl of a stand mixer. Allow the mixture to set for 5 minutes or until foamy. Add in the salt, flours, and olive oil. Switch to the dough hook and knead for 5 minutes. Meanwhile, pour 2-3 tablespoons of canola oil into deep cake pans (you need just enough to thoroughly coat the bottom of the pan). I used a 12-inch pan (pictured), and an 8-inch pan. Roll the dough into rounds 3-inches larger than the pans. Place the dough into the pans. Place cheese around the edge of the crust, then fold the excess dough over the cheese and pinch to seal. Cover the pans and set in a warm area (I used the proof function on my oven) for 1 hour. Stir together the sauce ingredients and set aside. 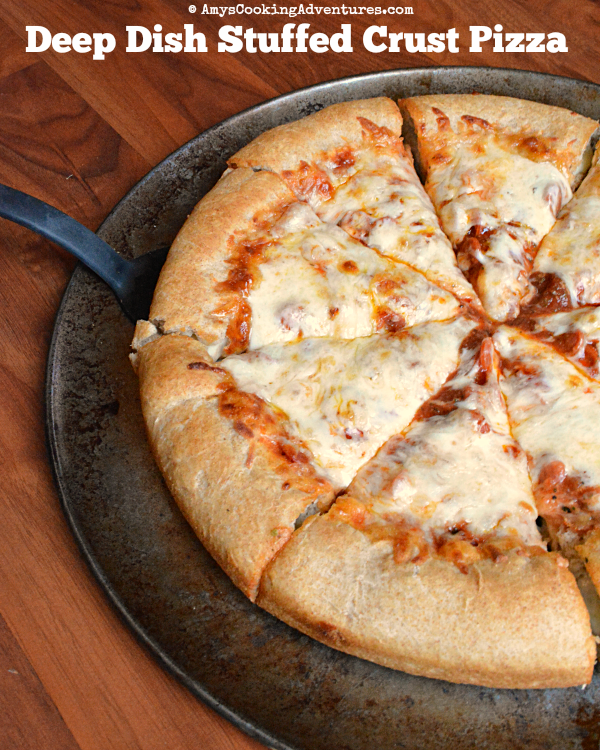 Divide the sauce between the pizzas and spread evenly. Sprinkle with pepperoni and shredded cheese, as desired. 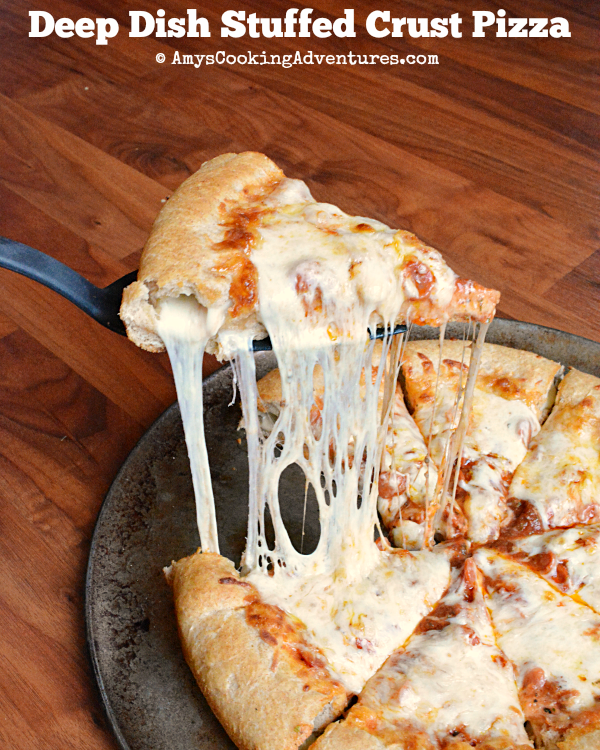 Brush the melted butter over the stuffed crust and sprinkle with garlic powder. Bake in the preheated oven for 15 minutes or until the cheese is melted and crust is browned. Cool slightly, then remove from pans, cut, and serve. This does look good! I have a feeling my hubby would love this to!